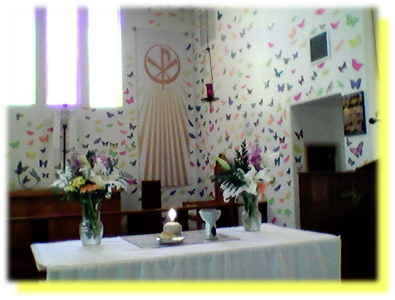 Easter communionWe, the members of Holy Redeemer Lutheran Church, are committed to being a radically loving and welcoming community of faith, centered in the Good News of God's Sabbath Economic brought to us by Jesus the Christ. Therefore, in faithfulness to the Gospel and our full Lutheran heritage, and to the best of our abilities, we promise to provide a place of safety, vision and care to all who seek God in this place. Why Butterflies on the header of our home page? What is the difference between being resuscitated and resurrected? Lazarus was resuscitated in being brought back to the same life he had before dying. Eventually, he grew old and died again. Jesus, however, was resurrected. He was brought back to life, but not the same one as before. He was a new being, one who could hardly be recognized by his disciples at first. The new life in which he was resurrected into was one in which knows no more death. Jesus would not die again after having been resurrected into the fullness of Christ. A seed turns into a plant or a flower, a caterpillar turns into a butterfly, and a tadpole turns into a frog. 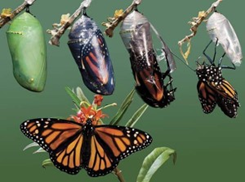 Each becomes a new thing, metamorphosed into a life changed radically. They are not resuscitated into what they once were, but become new creations of resurrection — made more beautiful from their transformation. If you look into a chrysalis, what you discover is an empty tomb. The caterpillar is gone; not resuscitated, but resurrected. Now lives a butterfly. Caterpillars crawl and climb, but butterflies float and fly. The caterpillar seeks and struggles all its life to become something more beautiful. The butterfly already knows what it means to be beautiful, and therefore seeks not to help itself but rather to share its beauty, grace, and goodness with others. The desire of the caterpillar is to improve itself; that of the butterfly is to bless others. Whatever good the caterpillar does for others, it is done as part of an obligation or precondition to achieve its real self-interested goal. But the butterfly is not centered in self-interest. It lives to bless, not be blessed. It is the difference between caring for others out of principle and caring for them out of character…between loving them out of duty, and loving them out of the joy of doing so. Being resuscitated brings us back to a life of the old fears, anxieties, and spiritual failings of the past. Being resurrected takes us to a new life in which we have no fear and no anxiety, and in which we are made complete and whole by love alone. To be resurrected into a life of perfect love is to know the peace that Christ gives to us…a peace not of this world, but of a world in which love -unconditional love- is the only thing that truly matters. God grant you the grace to be resurrected rather than resuscitated. May your life be an Easter miracle!